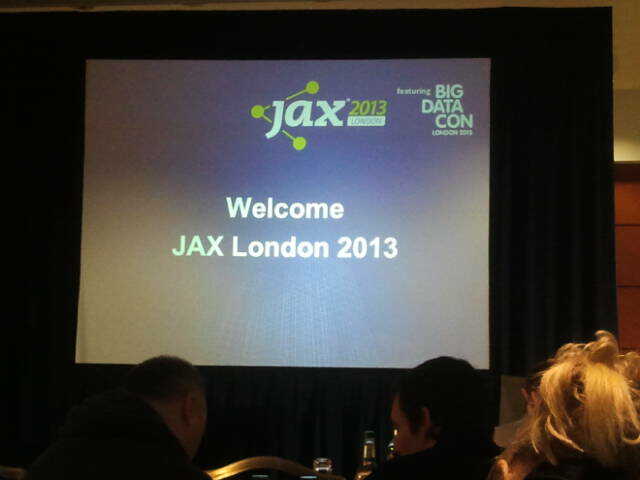 This was my first year at JAX London, so I cannot compare it to other years, but I must say that my level of satisfaction is quite high. The location was perfectly adequate –the place was very central and the rooms were fully equipped, comfortable and big enough to accommodate everyone interested in each talk-; the attendees were very keen on sharing ideas and impressions; the speakers were eloquent and knowledgeable… Everything one hopes to find when attending a conference. The first workshop was about Continuous Delivery, by Neal Ford. Although it was more a three and a half hours speech –totally understandable, as three hours is hardly enough to deploy a CI environment-, it was excellent. Neal is a great communicator, and the way he organised the talk made it very easy to follow. 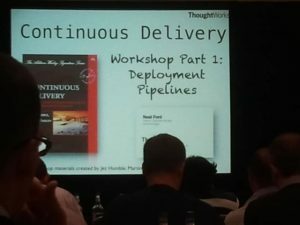 He threw some ideas about the common mistakes companies make when trying to create a Continuous Delivery environment, its added value once it is implemented properly and what best practices can be followed in order to make the most out of it. There is one sentence that made a huge impression on me and that from my perspective wraps up perfectly the points he was trying to make: how long would it take to deploy a change that involves just one single line of code? The second workshop was Writing Low Latency, High Throughput Processing Engines. Much closer to a workshop in its concept, this one made us realise that what we consider low latency is really not. The number of requests per second we could see running on our machines was so much higher than anything we had seen before that it opened our eyes. The first keynote was given by James Governor, a ridiculously good communicator. He spoke about How Java got its Mojo Back. Or even better, how Java never lost its mojo. Slide after slide he showed us in facts how Java searches have been stable for the last five or six years in places like Stack Overflow or Google. Also, he proposed a measure for language usages: the number of frameworks it has and how often they are present in the developers’ community. As the cherry on top of the talk, he gave some examples of companies that had started as Java deniers and had grown so much that they had realised Java was the simplest, most scalable technology available. Yes, that little blue bird most of us use every day was one of them. The second keynote was Databases and Agile Development. Dwight Merriman, chairman of MongoDB was in charge of this one. He talked about NoSQL databases –of course- and their scalability from the point of view of MongoDB. 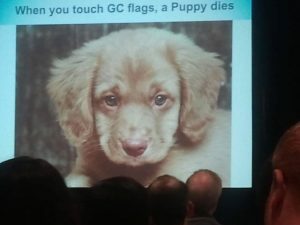 Unfortunately, my lack of knowledge about this topic did not let me benefit from this talk as much as from the others. The first session was about Lambdas in Java 8. I was really looking forward to this one, and it didn’t disappoint me at all. Simon Ritter went straight to the point and made very clear what Lambdas are, how they should be used and why should we use them. Two thumbs up! 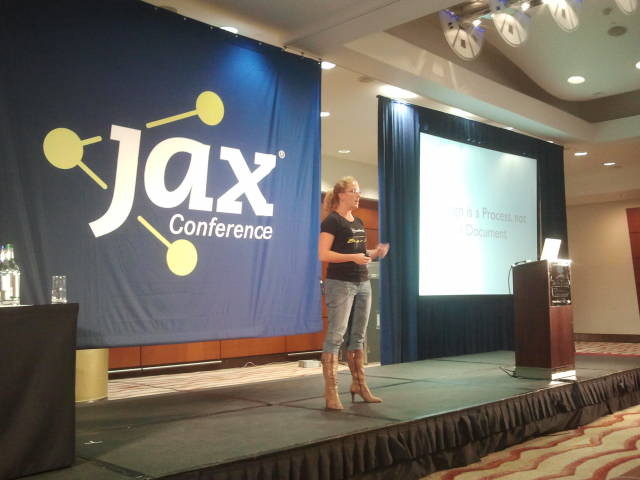 The second session was given by Trisha Gee, also from MongoDB. Under the title of Design is a Process, Not an Artefact, she made us realise once again how lost we are when we start a new project. She showed us all the evil monsters we can find along the road and how to effectively defeat them. She also talked about the importance of growing a community around our products so we can create a symbiotic relationship with them: other adventurers we can tag along with in our dangerous road. After the lunch break we were asked if we were Better Than a Coin Toss by Richard Warburton and John Oliver. No, seriously, they literally asked us that. Yes, they had a reason for it, but that was rude! On the positive side, they fixed their rudeness by giving us a great insight on how to analyse big data: from the easy and classic ‘remove the outliers’ to finding hidden patterns that not even the most expert eye could see without proper managing of the data. And just when we thought we had seen the best of it, Chris Bailey made our jaws drop in From Java Code to Java Heap: Understanding the Memory Usage of Your App. This guy knows more about the heap and the usage of memory than I would be able to understand in three lifetimes. One hour of how and why objects use the memory they use and how to optimise this usage. And not only his speech was great; when people asked him questions, he answered them concisely and without hesitation. He knew exactly what he was talking about. Awesome! The last talk of the day by Martijn Verburg and John Oliver was focused on Garbage Collection,. We all know that the best garbage collection technique is… not to touch the JVM’s garbage collection. Well, these guys had managed to identify more than 150 flags inside the JVM related to garbage collection –apparently there are more than 800 flags inside the JVM-, and they had managed to successfully walk their way through these flags, as they showed in a few charts that represented real optimisation examples. Quite amazing if you ask me. Unfortunately, I could not attend to the second day of conferences, but as far as I was told they were at the same level as the first day. I will definitely sign up for next year’s. Hope to see you there!